Learn more about SendInBlue marketing software with customer reviews, ratings, pricing information and frequently asked questions. SendInBlue is an email and marketing automation software platform. With SendInBlue, businesses can reach more customers by creating special campaigns, collecting contact information, sending out targeted emails and more. What is the price range for SendInBlue monthly plans? SendInBlue monthly plans range in price from 0.00€ to 49.00€ per month. Can I create SMS campaigns with SendInBlue? With the SendInBlue SMS features, you can create and manage SMS campaigns through your account. 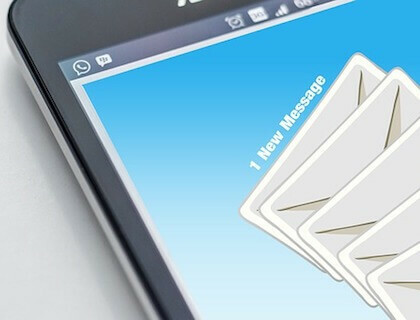 Text messages are a great way to stay in touch with customers because they go directly to the person without having to sit in their email inbox waiting to be opened. What is the SendInBlue customer service number? SendInBlue does not list a customer service number on their website, but you can fill out the contact form at sendinblue.com/contact/ and a member of the support team will reply to your inquiry. Most users agree that SendInBlue is a more affordable platform than MailChimp. However, MailChimp's email editor allows for a greater degree of customization and includes more plugins than the SendInBlue software. Does the SendInBlue email marketing software come with templates? The Send In Blue email editor has a full template gallery for you to chose from when you are building your email campaigns. These templates can easily be customized by dragging and dropping items to achieve the look that you want. Where can I find the SendInBlue login page? To log into your SendInBlue account, just go to sendinblue.com/users/login/ in your browser and enter your username and password. If you don't have an account yet, click "Create An Account" and follow the steps. Great for sending out clean, professional emails to our customer base. On the negative side, the signup forms are not as customizable as other software. SendInBlue has wonderful customer service and it makes email marketing extremely easy for beginners like me! This is a very affordable solution that does a good job. One improvement that should be made is added compliance to GUI image standards. Competitive pricing and seamless contact management make this an ideal tool for our business. Sometimes the editing window freezes, but that is the only problem I can think of. MailChimp was too expensive for us, so we switched to SendInBlue. With the exception of the sometimes glitchy email editor, we've been very pleased with the results. SendInBlue is a great bulk email service because it is reliable. The software is consistent, so I don't have to worry about encountering unexpected errors. A good interface with no limit on the number of email addresses that you can store. I would recommend this service to others. This is not the most intuitive marketing automation software that I have used, but it works well with WordPress sites. This product is the best value for your money in this particular segment. It's easy to use and although it doesn't have many plugins, it still gets the job done. A cost-effective, user-friendly solution. What holds SendInBlue back is that it's features are much more basic than competing software platforms.